Having a reliable heating system in your home this winter is necessary to get the most out of the season. If you have moved into a new home, or you are interested in getting rid of your older heater, now is the right time to get a new installation—before the heavy chill hits. You have more choices for home heating than you once did. Here are some of the options you should consider for a new heating system in your Columbus, OH home. Quality Air Heating and Air Conditioning can offer you more advice when you’re ready to make the decision. Furnaces are one of the most common heating systems found in American homes. Chances are good that if you’re looking to replace an old heater, it’s a furnace. Most furnaces today use natural gas or electricity to run, and the energy supply in your home will probably determine which one you’ll need. Gas furnaces are among the most efficient heating options on the market, although electric furnaces have improved their efficiency over the years as well. If you already have existing ducts for forced-air heating, then getting a new furnace installed presents few difficulties. A heat pump offers a “two-for-one” deal: you get a heater and an air conditioner in one unit. A heat pump operates similarly to a standard AC, except it can reverse the direction of the heat exchange, so instead of the refrigerant removing heat from indoors and putting it outdoors, you get heat taken from outdoors and moved indoors. Heat pumps can have trouble handling extremely low temperatures, especially if your house lacks proper insulation, so have an expert perform a heat load calculation in your home so you can determine if a heat pump will keep you warm in winter weather. The recent growth in using geothermal energy to heat homes presents exciting possibilities. A geothermal heat pump offers environmentally-friendly and energy-efficient warmth. Using coils buried in the ground around your home, a geothermal heat pump draws up the heat of the earth and puts it into your home. However, geothermal won’t work for every location, so you’ll need to consult an expert first to see if this is a workable option for you. Whatever system you need installed, Quality Air Heating and Air Conditioning will do the work right the first time. 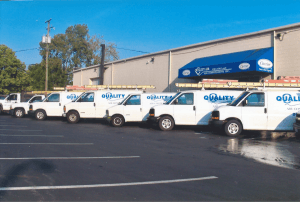 We serve all of Central Ohio, so we’ve got your heating installation in Columbus, OH covered.